Capturing every single manufacturing data from supply chain, analysis based on 30-years on Sheet Metal expertise and standardization in a Data Gateway to be integrated on an external SAP or in a Business Intelligence Cockpit. Or in Lantel BI module. OEE, Machine Monitoring, Inventory: Real knowledge for real improvement. Lantek Manufacturing Analytics is an advanced manufacturing intelligence module that collects all the production system data and filters, groups and compares it to enable decision-making based on information that is reliable and always up-to-date. Lantek Expert and Lantek Flex3d are CAD/CAM software solutions that enable you to manage all the cutting machines with the same program, regardless of their technology, type of cut or manufacturer. 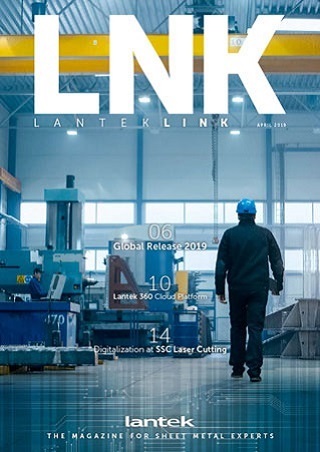 Moreover, if you use Lantek MES, the most advanced Manufacturing Execution System in the market, this useful information is increased with data from other non-cutting processes and from the efficiency of a whole line or order. Lantek Manufacturing Analytics compiles, compares and displays the data of the whole process so you can do your job: make decisions to optimize production. Understanding past performance: OEE of each machine. Availability: This is the percentage of time that a machine has actually been running over the time that it should have been running according to planning. Performance: This shows the actual productivity over the theoretical maximum productivity. With this ratio you can see the evolution of productivity in a machine, line or plant defined by specific criteria in each case. Quality: This is the percentage of good parts that have been produced by the machine, line or plant over the total produced according to the defined quality standards. What is the current status of a machine? Machine Monitoring will inform you about the status of your machines whenever you want, according to three basic statuses: in operation, in planned stop and in unplanned stop. A control panel that is always on top on your desktop or mobile device will enable you to monitor your line or plant at a glance. It is not enough to know how much material of each type we have at a certain time: a system of warnings and automated forecasting will anticipate stockouts. This predictive capability will allow you to keep smaller stocks, which means significant savings and efficiency improvement. Knowledge is power... do you own it?